When you are ready to upgrade to Google Analytics Premium, you will want to work with analytics experts that can assess your needs, collaborate with you to develop a digital measurement strategy, and get your implementation right the first time. Plus, our analytics and marketing team will be available to you on an ongoing basis to help you optimize your website and marketing campaigns. All of these value-added consulting services are included with your Google Analytics Premium license. Premium Features. No Hidden Fees. Only Unexpected Benefits! or view our Google Analytics Premium vs. Standard comparison page. Value added services you only get when you purchase Google Analytics Premium through Blast. Have you ever seen such a comprehensive analytics and website/marketing campaign optimization solution? We haven’t. Contact us for more details. Get more data, more quickly. Deeper insights for better results. Consistent data you can rely on. If you have questions or are ready to discuss how Google Analytics Premium can help you EVOLVE your organization, talk to a Blast Solutions Consultant today. Is Premium Your Best Option? In short, it depends. But, we can help you figure that out. To review your unique tracking needs for the best solution, Ask an Analytics Expert. 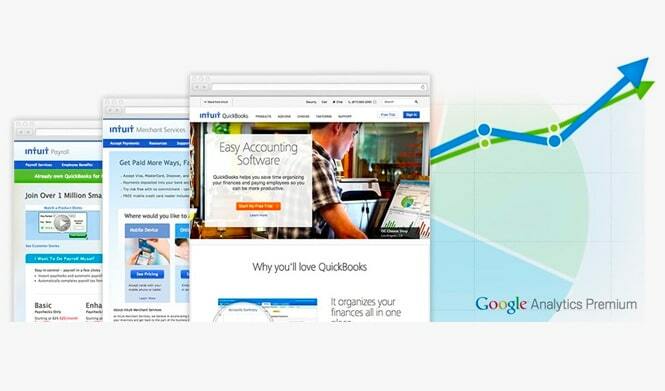 Learn how we helped Intuit better understand search traffic and optimize site performance with Google Analytics Premium that provided business-critical scalability and actionable insights.